Lack of adequate health literacy can have a detrimental impact on health outcomes, as well as healthcare cost. The Health Sciences Library at the University of North Carolina at Chapel Hill (UNC-CH) serves as the information hub of health literacy efforts on campus and throughout the state of North Carolina. We offer workshops and training for students, educators and health care professionals to raise awareness of the impact of low health literacy, as well as strategies and tools to incorporate health literacy into practice in order to improve health outcomes. The Health Literacy Data Map website provides an interactive, searchable, national map of health literacy estimates for neighborhoods throughout the United States. It was developed by Dr. Fang and Dr. Bailey at UNC-CH. Click on the map below to get started. 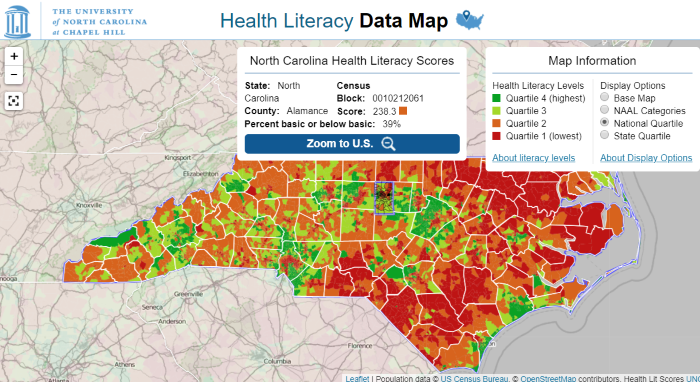 NCHealthLiteracy.org was established in 2007 as the NC Program on Health Literacy by the Sheps Center for Health Services Research at UNC-CH.